They say you shouldn’t judge a book by its cover. But some New York City buildings are hoping you do. Moving beyond the prolific shiny glass exteriors, many buildings are opting for exterior facades with richer, more textured materials like concrete, limestone, panels, terra-cotta and masonry brickwork. Not only do these buildings enrich the skyline with beauty and diversity, they also build on local design traditions and foster a true sense of place. Below are eleven examples of the newest trend which harkens back to the past and adds visual dimension to the modern skyline. 30 Warren is a modern, boutique condominium designed by the innovative and impressive Parisian firm Post-Office Architectes. 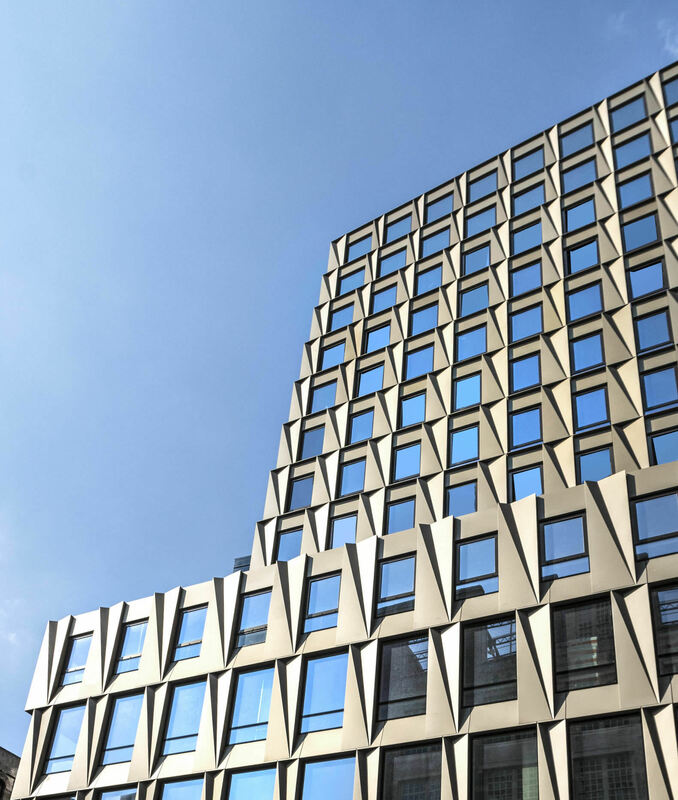 30 Warren’s design team pioneers a new form of custom-crafted architectural concrete for the building’s facade that both connects with the surrounding architecture while employing a more avant-garde aesthetic. Incredibly thin yet strong, the large panels of architectural concrete function together as a veil that encapsulates the building. The ribbed pattern adds an additional texture and visual element, while the deep gray offers a warmth and domesticity to the condominium. Starchitect Sir David Adjaye was inspired to create a building that pushed away from the typical commercial feel of glass and, instead, embraced New York’s history of masonry architecture. 130 William’s custom, hand-cast façade is a contemporary interpretation of the stonework that characterized classic Manhattan architecture. The textured façade gives way to smooth and delicately-crafted details, which all come together with refined bronze detailing. Another signature feature is the unique silhouette of rhythmic large-scale arched windows that draw inspiration from the lofts that once populated the area. 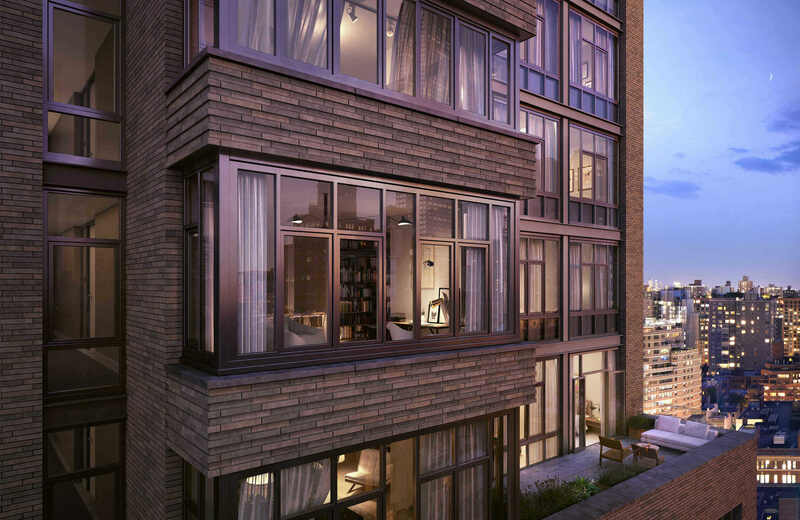 An Anbau development, designed by renowned Morris Adjmi Architects, is located in the Landmarked District of the Upper West Side and combines the classic appeal of pre-war residences with the expansive spaces of modern loft-like living. 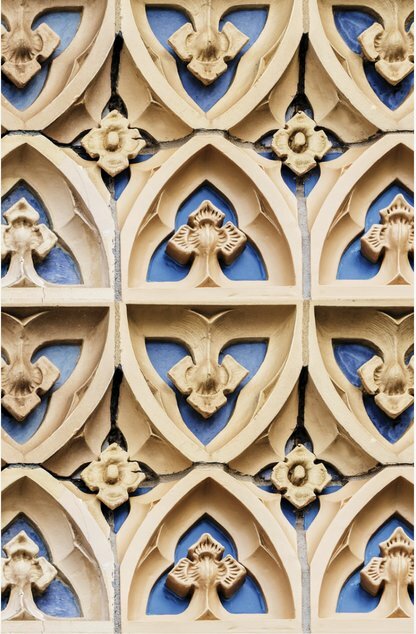 The boutique condominium’s exterior features more than 200 panels of handcrafted terra-cotta by California-based ceramics firm Gladding McBean, one of the oldest in the country circa 1875, and an Art Deco-inspired cornice crown with detailing that pays homage to the design of old world neighborhoods. The terra-cotta motifs were created using traditional techniques which pressed into molds, baked, dried, and trimmed by sculptors, and flown in from California. The end result is that no two pieces are exactly the same, complete with the sculptors’ thumbprints. Situated in the Upper East Side’s Carnegie Hill neighborhood, DDG’s luxury condominium 180 East 88th Street features a striking facade comprised of nearly 600,000 handmade bricks from acclaimed Danish brickworks Petersen Tegl. Inspired by the pre-war boom in high-rise masonry construction in New York during the 1920s – 1940s, DDG’s design team sought to pay homage to the lost art of traditional craftsmanship as well as connect the building to the surrounding architecture. The distinctive bricks, which include the elongated Kolumba style, possess a thoroughly unique texture and color palette that reflect their handmade quality and offer a welcome contrast to the numerous glass towers dotting the Manhattan landscape. Under the architectural and aesthetic direction of Thierry W Despont, the top thirty floors of the Woolworth Building are being re-imagined into the celebrated Woolworth Tower Residences of thirty-three prized condominium residences. Alchemy Properties, who developed the property, have spent more than $20 million restoring the striking terra-cotta facade of this iconic tower. The restoration included the polychromatic terra-cotta surrounds which were sent to Boston Valley Terra-cotta, to be restored, repaired or recast. 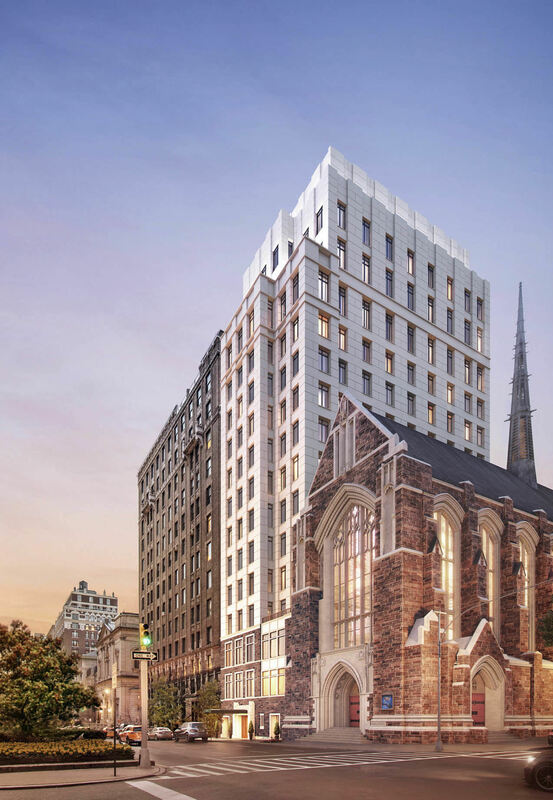 Developed by Alchemy Properties (the same team behind the Woolworth Tower Residences), is a curated collection of 31 ultra-luxury condominium residences designed by critically acclaimed firm Robert A.M. Stern Architects, the kings of limestone. The elegant and classic silhouette of the building is punctuated by setbacks and decorative window openings. Then finished in elevated limestone and handmade grey brick articulated frieze details is inspired by the grand pre-war apartment buildings in the neighborhood. 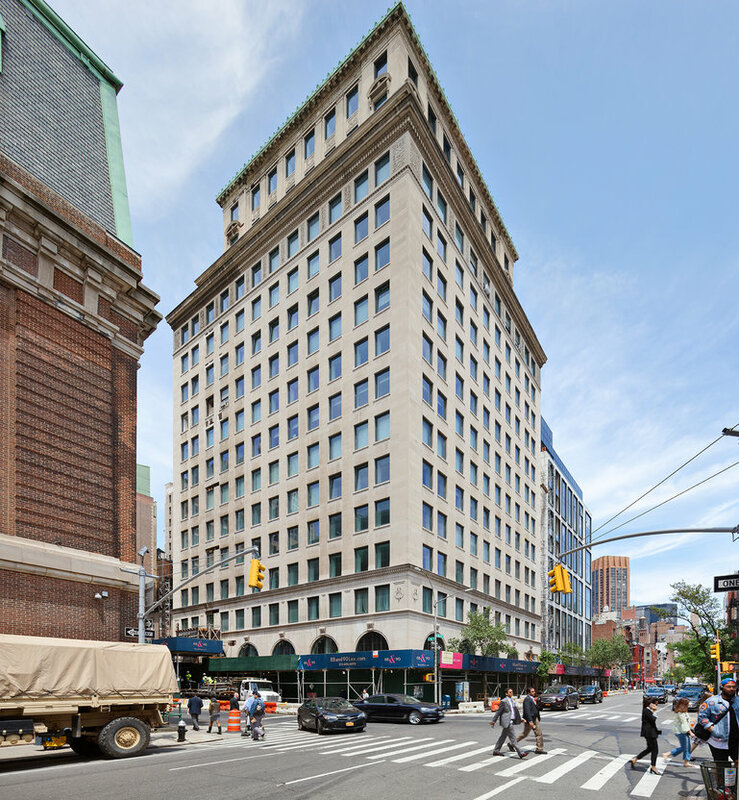 88&90 Lexington is an architectural anomaly that celebrates the marriage of old and new by merging a classic pre-war building with a modern post-war building in the heart of NoMad. The two buildings had separate identities in their previous lives, 88 Lex, the pre-war half, was a rental building while 90 Lex, the modern half, was a former commercial office space. Built in 1927, 88 Lex features a sand-colored limestone façade with art deco detailing that was preserved during the building’s conversion. Located along Park Avenue’s historic district, 1010 Park Avenue is a rare ground-up development showcasing 11 full-floor and duplex residences. 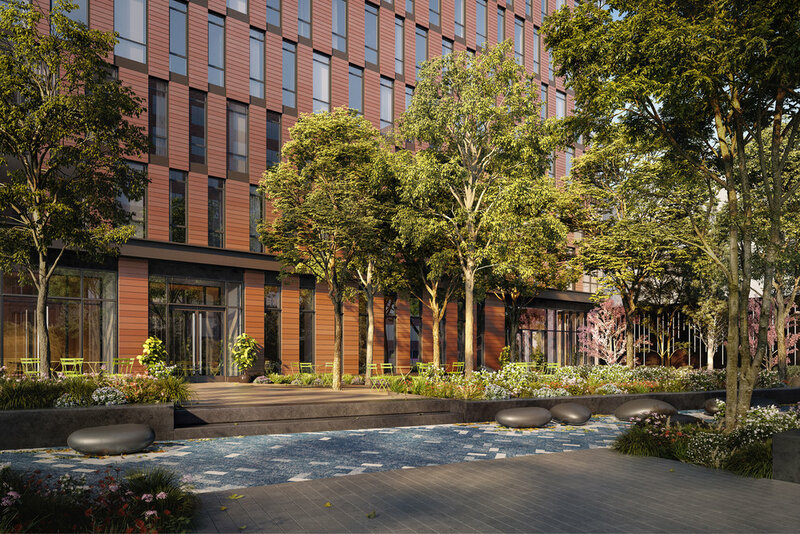 Although the development is a new addition along the Park Avenue corridor, the exterior was designed with respect to its surroundings. 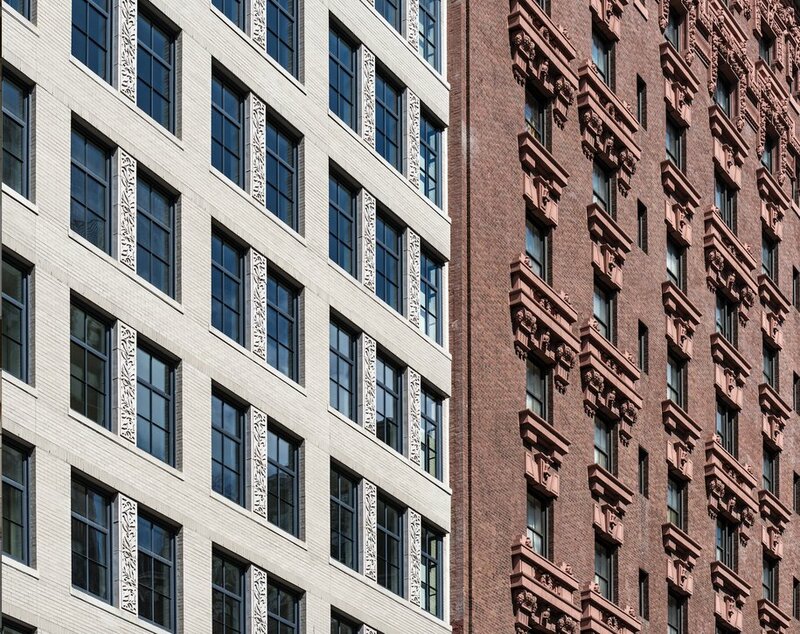 Architecture firm Beyer Blinder Belle created a facade composed of textural Manhattan schist on the lower floors while outfitting the rest of the exterior in hand-cut Indiana limestone, to create a dynamic but respectful facade. 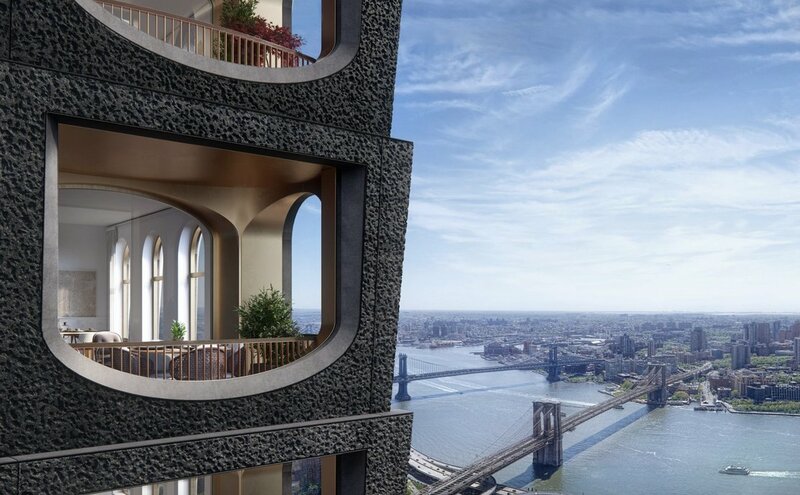 Situated at the nexus of Brooklyn Heights, DUMBO and Downtown Brooklyn, The Amberly is a highly anticipated and soaring new 33-story luxury rental tower with an incredibly unique facade. 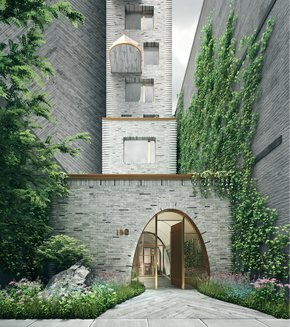 Internationally renowned architecture firm Woods Bagot designed The Amberly – its first tower in North America – to be a modern interpretation of the historic brownstones of Brooklyn. The warm, terracotta facade, was intelligently patterned to maximize light and views in the living and dining areas by giving way to floor-to-ceiling windows, while maintaining privacy within the bedrooms. 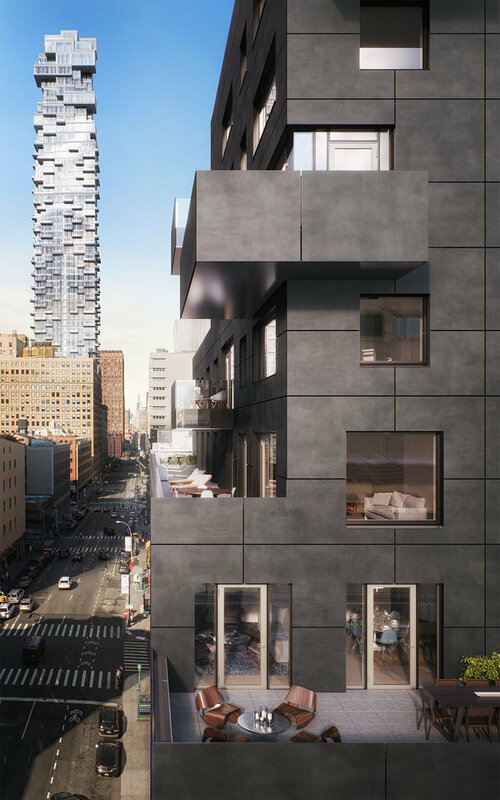 Powerful and sculptural in form, 242 Broome, the first condominium within the Essex Crossing development on Manhattan’s Lower East Side, stands as a testament to the ongoing evolution of its neighborhood. Designed by SHoP Architects, the firm behind Barclays Center in Brooklyn, the building features a champagne-colored façade of anodized aluminum, with bends and angles in the metal that resemble the iconic fire escapes of the neighboring buildings. Starting at the fifth floor, the building begins to twist in shape slightly westward, allowing for dramatic views, natural light and maximum privacy. The Lindley, a new 20-story, full-service condominium building designed inside and out by Rawlings Architects, best known for the boutique SIXTY LES Hotel, Greenwich Village’s 215 Sullivan and NoHo’s upcoming 40 Bleecker, The Lindley’s exterior is a timeless design with a facade comprised of varying shapes and shades of brick, giving the building both depth and texture.